Welcome to Wentworth Joinery & Construction. We are a family run business with over 40 years experience in Joinery and Construction. Based in the heart of the Staffordshire Moorlands, we are well located to serve the areas of Staffordshire, Derbyshire & Cheshire. If you cannot see what you are looking for on our website, then please feel free to contact us. Established in 1969, our goal has always been for total customer satisfaction with an unrivalled commitment to Quality Joinery. Whatever size of job, we always take care & pride with our work. 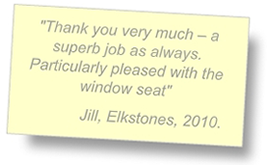 Our Services include the manufacture of bespoke timber windows, doors and conservatories. We can also offer full barn conversions and roofing services.